Dries is just a minute. Permanent and washable. 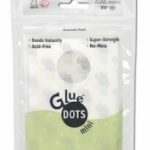 Great for crafts including felt and foam. Perfect for hems and small repairs. 2 oz. 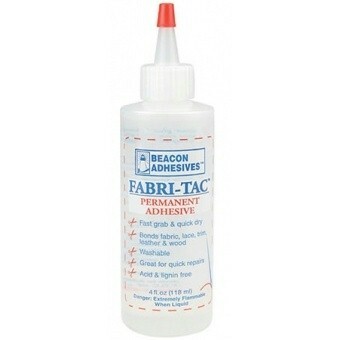 2 reviews for "Fabri-Tac Fabric Glue"
Works perfectly for the banner in a bag kit. Worth the price! Fabri-Tac works! 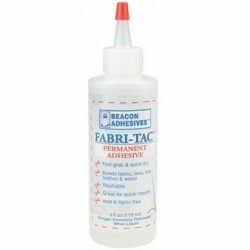 Purchased to use with the SWAPS kit, have used it to glue yarn to wood beads, beads to felt, felt to felt… if it’s fabric based, you need Fabri-Tac! I’m going to try it with the “iron on” Daisy Petals, which we all know fall off before the third meeting…. Hoping that it will do the trick with the girls’ uniforms.